The past few years have seen an explosive amount of growth for the Kodi development team. The popularity of the program has grown tremendously and in turn caused a massive increase in the amount of hardware solutions available to consumers. Perhaps the biggest advancement was the launch of the Kodi being made available on the Android operating system. Thanks to it’s “open source” nature we’ve seen Android boxes flood the market with new companies entering the rat race every day. All the options have paved way to more powerful boxes at more affordable prices, listed below are the boxes we’ve used that have made a significant impression on us at a very reasonable price point. 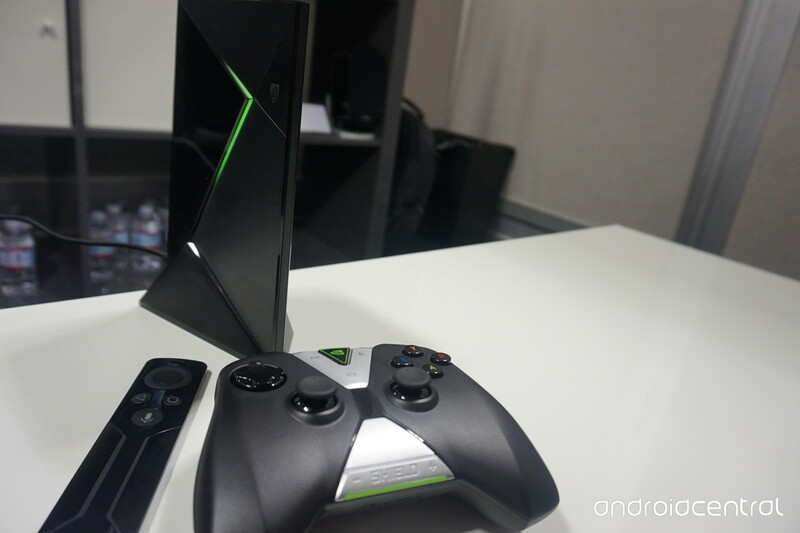 Months back we wrote what we felt were the best Android boxes available. The NVIDA Shield (on sale), while being a more expensive option, continues to top the list in 2016 in terms of reliability, speed, playback and extra features. The great thing about the Shield is the extras, but if you’re looking for just a Kodi box under $100 that handles everything you need for your favorite shows and movies there are a lot of great options on the market. I’ve based this list on personal experience but also from feedback from other users and I’ve found it may have a lot of options other people just aren’t aware of. A lot of these boxes pack a punch, have 4k playback, storage, extras (like HDMI cables, remotes etc) and have Kodi pre-installed so you don’t have to spend a lot of time figuring out how to install. Some of the other options have been around for quite some time and will require you to use your tech know how to get Kodi up and running, thankfully you’ve come to right place for Kodi Tutorials. Let’s start with our first option. 6 What Did We Miss? CPU:Comes loaded with a Amlogic S812 Quad core Cortex 2.0 GHz. WIFI: Dual Band 802.11a/b/g/n at 2.4 and 5 Ghz (have been complaints from people claiming this box won’t connect to a 5Ghz network). Expandable Memory: SD Card support up to 32GB but fully capable of adding additional storage via USB or External Hard Drive with the two USB ports. Like a lot of the newer boxes on the market today the M8S comes equipped with the capability to play 4K content. While 4K hasn’t quite hit that many homes it’s only a matter of time before it becomes more and more common. Kodi already has some add-ons that are capable of finding the latest 4K movies so if you’ve got everything you need to play 4K then you should be most certainly be searching for a box that is capable of handling it. Like most of the boxes we’ve picked out on this list, it’s capable of handling pretty much every video Kodi can throw at it. Built on the Android Platform. Lost in a lot of the hype surrounding Kodi Android boxes is the fact that some of these can be a complete home entertainment system. The AKASO M8S provides the capability for you to install pretty much any application from the Google Play Store. 3D games, YouTube, Browsers, Emulators etc. make this box more then just a Kodi media player. Kodi Pre-Loaded. If you’re not a very tech savvy individual it’s nice that some of the boxes come pre-loaded with apps like Kodi, Netflix, Hulu, etc already. That being said it’s recommend to uninstall Kodi (if not the latest version) and install the latest build that’s currently released. The Price. It’s a little hypocritical to say in this list but at $47.99 it is the best bang for your buck. A lot of our products mentioned will feature close pricing but the reliability, hardware, and customer support makes it one of the cheapest and most reliable boxes on the market. 2GB Ram. Some of the older market boxes out there come equipped with 1GB of ram. While it’s sufficient having an extra GB of ram can make a much needed improvement in simple things like menu navigation, buffering, etc. The Remote. I’ll undoubedtly put the remote as a con for virtually every box on this list as many of these box makers provide a cheap solution that comes included. If you’re an avid Kodi user you should consider purchasing an upgrade for your remote, one that has a mouse and keyboard built into it. AKASO has a wireless solution that works very well and is under $20. Lack of ability to update Android. It may not mean much to most but not being able to keep your OS up to date can be a disadvantage. It’s possible that certain apps (like Kodi) may require you to be updated to the latest version of Android in the future. I expect the M8S at some point to be updated but for now it’s stuck on 4.4 (with Android currently at version 6). 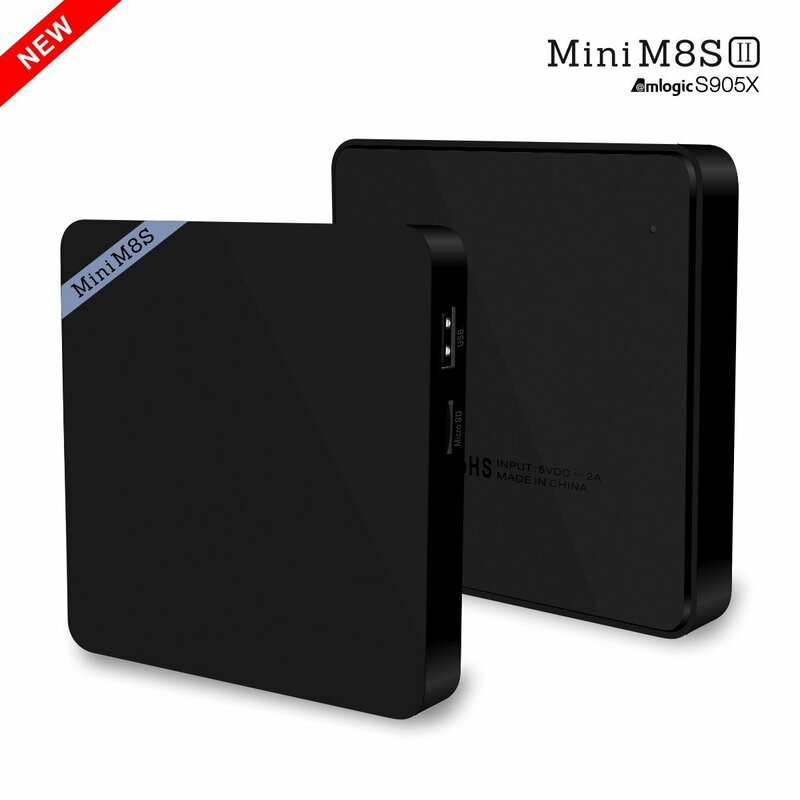 The M8S is one of the most popular budget boxes for Kodi on the market today. It’s shortcomings of not being able to update Android to the latest version shouldn’t be looked at to negatively as this little box packs a powerful punch. Having used it ourselves and hearing feedback from dozens of users there’s a reason we recommened this as one of our top choices for Kodi players under $100. Despite complaints and warnings from the Kodi development team surrounding box sellers and pre-configured options on the market these boxes will continue to be a top seller as more and more people cut the cord and watch the content they want ad free. Whether you use Kodi with 3rd party addons or not the M8S won’t disappoint you with it’s performance and capability to play anything and everything you want. Expandable Memory: Micro SD Card support but also comes equipped with two USB slots you can use for external storage or connecting a keyboard/mouse. Video playback is superb. Kodi playback on the Mini M8SII supports a variety of playback options thanks to it’s decoding capability. The new H.265 bit 4k at 60 frames per second will have you future proof for some time to come as 4K video starts to become common in our living rooms. If you don’t have a 4K TV this box will still be able to handle everything you throw at it (1080, 720, etc) making it a great choice for your home entertainment player. Powerful enough to handle anything you throw at it. Coming equipped with a Quad Core processor the box is capable of playing virtually anything it can install. 4K video playback was great and even installing 3D games from the Google Play Store provided a fun experience converting our TV into a gaming device (you may want to look into purchasing a game controller if you’re thinking of playing games on this). Easy Setup. This box comes loaded with a handful of streaming options. If you’re looking specifically for Kodi you’ll be running in no time. While having Kodi pre-installed is a plus it also comes loaded with things like Netflix, Hulu, etc. Meaning more down time to enjoy your favourite movies and TV shows. Extra USB Options. It’s becoming more and more standard on streaming boxes these days so it’s something you should be looking for when purchasing. Whether you want extra storage or perhaps a keyboard/mouse combination to control Kodi this box provides the ability to do so. WIFI and Bluetooth capability. The remote that comes with the Mini M8SII works but if you’ve ever used Kodi before you know it can be tiresome using a remote to type in search queries. With both WiFi and Bluetooth enabled on this box you can pair a keyboard and mouse to make it easy to navigate menus, browse the web and even play games. The remote. Like a lot of other options out there the remote appears to be an after thought. I’m not saying it’s terrible, it works, but if they were to invest (or just use) something similar like the handheld keyboard like the Rii 8 it would solve every problem. 100Mb Ethernet. Not necessarily an issue if you’re simply streaming content online but as something released this year (2016) I was hoping for Gigabit LAN. The Price. With tongue in cheek I have to say this isn’t really a con at this point but as this is a list of the best Kodi boxes under $100 this one is in the upper echelon of pricing. It’s regularly priced at $79.90 but currently on sale for $59.90. 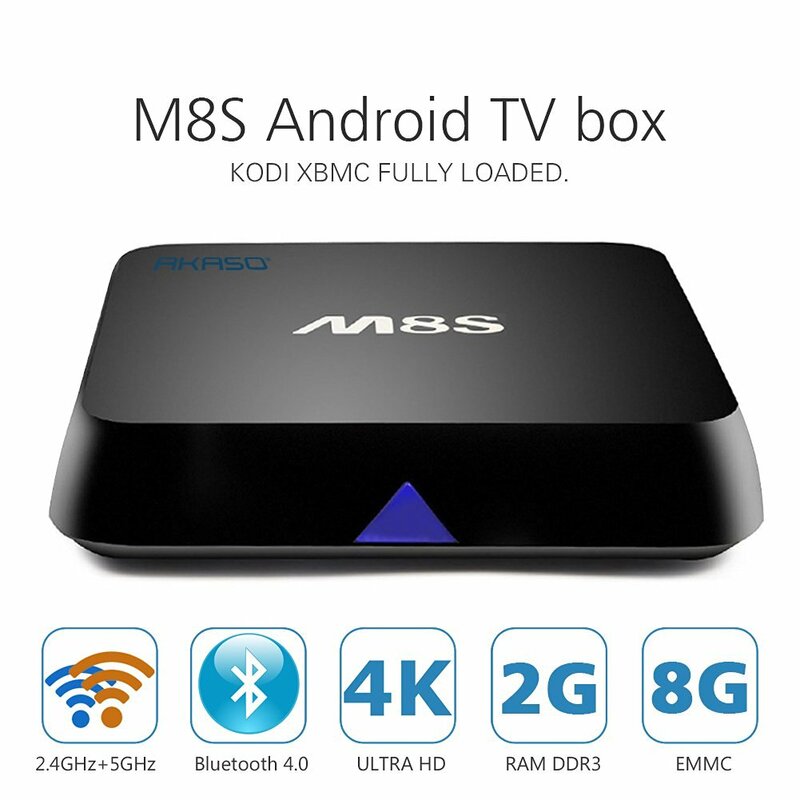 As a new player in 2016, the Mini M8SII is easily one of our favourite options for new Android Kodi boxes. You can look at the Mini M8SII as a tablet in a box. A lot of other boxes are built on Android but the software is custom designed (think Fire TV, Google TV, etc). The benefit to running on Android Marshmallow is you’re capable of running pretty much anything from the Google Play Store making this more then just a Kodi box (should you choose). Whether this is just for playing Kodi this box provides the opportunity to convert your home entertainment system into more with 3D games and other applications from the Google Play Store. The Mini M8SII is more then capabale of handling your Kodi needs. At $59.90 it’s a little higher priced then some of the other on this list but with it you’re getting a bit more beef out of your box, an updated version of Android, the latest version of Kodi (for now), and more. If you’re looking for a robust option with a little more power then the Mini M8SII is for you. WIFI: Dual Band 802.11 b/g/n. Expandable Memory: Micro SD Card support. The Operating System (in this case OSMC or OpenELEC) will need to be loaded and run from the MicroSD Card. The device has 4 USB ports that can be used for things like a Mouse/Keyboard, external storage, etc. 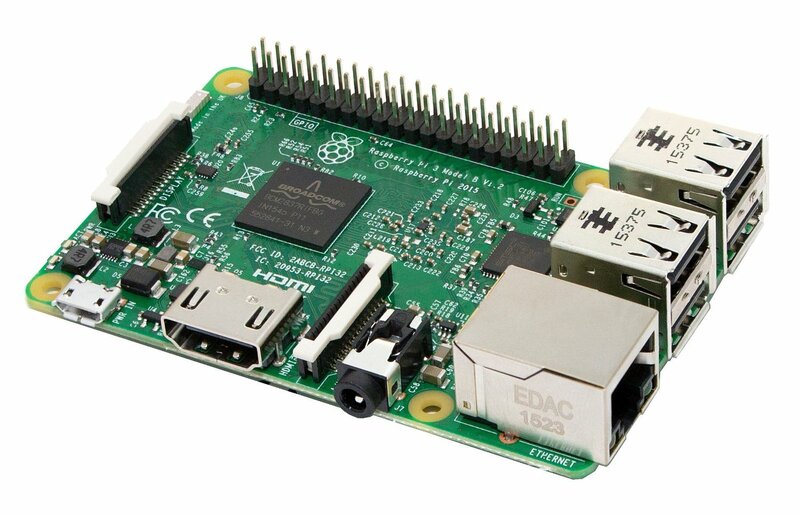 A few years back the Raspberry PI2 was a popular choice amongst Kodi fanatics due to it’s low price point. Unfortunately there were some complaints with it in regards to playback as the hardware on the device was falling behind some of the more popular box options out there like the M8S, the Amazon Fire TV, Nexus TV etc. Since then though we’ve had a new version released with the Raspberry Pi3 which has made significant improvements. Menu browsing is smooth and crisp and playback on the majority of videos is flawless. Depending on which OS you use for your Kodi playback there has been some hits and misses from both but most of the complaints come from playing large Blue ray rips locally on the device. If you’re just using the device for internet streaming you shouldn’t have an issue playing 1080p playback but it’s recommended that you use a wired ethernet solution to reduce buffering. Lowest Price. The Raspberry Pi3 itself is the most affordable solution for people wanting to have a Kodi set top Box. It lacks some of the hardware that the other boxes have but is more then capable of playing most content. Sideload Multiple OS’s. If you’re someone who enjoys playing around with gadgets then the Raspberry Pi3 is a dream come true. While the device doesn’t have onboard storage that runs the OS it’s one of the perks that makes working with the Pi3 fun. With MicroSD cards under $10 now a days you can sideload multiple operating systems onto these cards allowing you to run OSMC, OpenELEC, Linux, and more on the PI3. 4x the USB Love. The majority of pre-built Kodi boxes come equipped with one to two USB ports. The Raspberry Pi3 has 4 allowing other goodies to attach to the device. External hard drives, USB drives and more can be attached. Tech Knowledge Necessary. The Raspberry Pi3 isn’t as user friendly as some of the other options on this page. You’ll need a decent tech understanding or be able to follow instructions. Other boxes have everything pre-loaded whereas the Pi3 you’ll need to manually load Kodi onto an MicroSD card and do some configuration options to get everything up and running. No remote/extras. At $35.70 the Pi3 is one of the cheapest options to get up and running with Kodi. If you have a spare USB keyboard and mouse laying around you can use it but if not you’ll need to invest some money into one. As recommended in our other budget Kodi boxes you don’t need to break the bank here and something like the Rii8 Keyboard/Mouse Combo will work wonders in Kodi. It’s also important to understand that while you can purchase the PI3 board for $35 dollars you’ll need some other things to use it, that’s why we recommend investing in the starter kit as it includes a MicroSD card, power supply, case, and more. If you’re into technology (and I’m assuming you are reading about Kodi players) then the Raspberry Pi3 might be right up your ally. While it’s not the most powerful solution in this list it is more then capable of handling Kodi playback. One of the best things about the device is the ability to load multiple operating systems onto multiple SD cards to test and play around with it. If you want to watch movies on Kodi, load up OSMC or OpenELEC and let it go. If you want to search the web or learn some linux, pre-load a linux distro and get to it. For the average user who wants something simple that’s plug and play the Pi3 is not for you but with the ability to do just about anything it is a tech’s dream device. If you’re just getting started with it we advise to buy the starter kit as it features everything in one, the $35 option is for the Pi3 board only and you’ll need to purchase the MicroSD, power supply, case etc separately. Since owning a FireTV I haven’t had one issue with video playback. In times of stuttering or buffering it’s been an issue related to my ethernet connection. 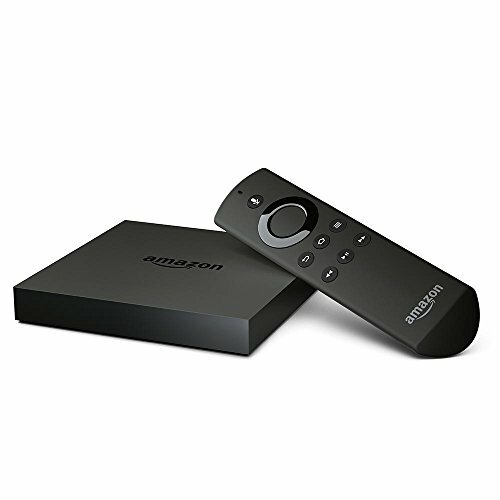 The latest version of the Fire TV comes equipped with everything you’d expect for video performance and is capable of handling everything up to 4K with ease. The picture is crisp and clear on every test I’ve run. The complication comes if you’re running the Fire TV Stick instead of the box. The boxes advantages outweigh the stick but the price point may end up being a concern if you’re looking to not break the bank. If you’re looking to get into flawless video playback the box should be an easy purchase, the Fire TV stick on the other hand may result in some stutters with higher end video. Still at just under $40 the Fire TV stick will handle basically everything Kodi is capable of streaming and most of your buffering issues will result in the sometimes spottiness of WiFi connections. Longevity and Support. Backed by Amazon the Fire TV isn’t going away anytime soon. While a lot of other boxes out there may be cheaper there’s a chance they may not have the support you should expect from a massive company like Amazon. With their commitment to building the platform the device should see regular updates for a long time to come. More then just Kodi. Hundreds to thousands of apps await on the Fire TV for your use. One of the nicest features is it’s integration with all other Amazon services like Prime. If you’re a prime subscriber you’ll enjoy some of the extra content and the ability to “rent” movies off the service should you choose. While Kodi will have most of those options already sometimes it can be challenging to find a reliable stream which shouldn’t be a problem from Amazon. Ease of Use and 3rd party Apps. Having used the Fire TV as one of the first options for Kodi it’s been an easy transition. While the installation of third party apps can be a bit confusing for some tech novices out there you shouldn’t feel overwhelmed as there are hundreds of tutorials out there that will help you get up to speed with installing Kodi. The remote (sort of). I listed the remote here based solely on the fact that I hate having to manually use it to type out search queries. That being said the newer versions of the Fire TV remote have voice search enabled through the Alexa platform making finding stuff on the Fire OS/Fire TV very easy. Unfortunately this doesn’t work in Kodi (yet) so you’ll be left with searching manually using the up/down left/right arrows. When you’re entering in long URL’s for sources this can eventually get a little tiresome but if you’re not at picky this shouldn’t be to much of a concern. The other part of the problem I’ve found with the remote is the astounding amount of batteries I’ve had to go through. Don’t be fooled, this is geared towards Amazon Content. If you’re a prime member you’ll enjoy the extra options but this device was built with Amazon Prime in mind. That means you can end up being limited to what’s only available on Amazon (unless using Kodi), Netflix, Hulu etc. While you have options to work with other streaming providers you’ll need a subscription to almost all of them in order to expand your library. Kodi is free but again it’s a topic for discussion of the legality of third party apps in that program that open up free options. If you’re OK with it then this won’t be an issue. Fire OS. The operating system running on the Fire TV is pretty slick! It works well with everything created for it and even Kodi is easy to operate and manage as a third party app. Thanks to a recent update you’re even capable of launching Kodi from the home screen which was a huge deal in the past. Still, if you’re wanting to use the Fire TV for more then just Kodi you may be out of luck in regards to certain features and apps. 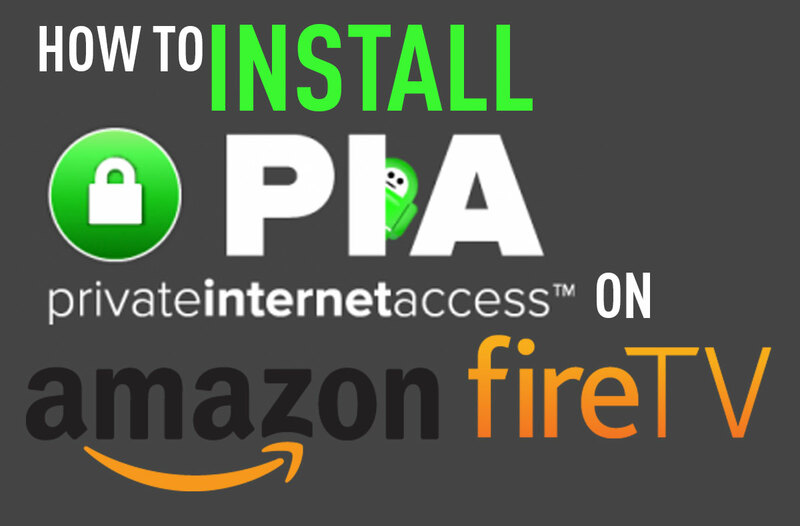 One of those being something like a VPN (which you should use if you’re using Kodi to stream). As an avid user and promoter of Private Internet Access it’s discouraging not to be able to use their Android app on the Fire TV. These are some of the things to consider before purchasing. The Fire TV exploded when it came onto the scene and it was rightfully justified. It’s got poise and polish thanks to being developed from Amazon and with a huge development team behind it you should only expect it to get better. Video playback is flawless and it’s handled everything I’ve thrown at it with no issues from full Blu-Ray rips to HD streaming content. It also has the ability to integrate with multiple other streaming services like Netflix which can enhance your options for content. Kodi use is flawless and smooth, the only issue will be getting Kodi installed on the device which you can do so quite easily through the use of ES File Explorer. While the price is the highest of the boxes listed it comes with a safety net knowing Amazon should replace it should you have problems with it. Simply put, if you’re looking for a no fuss box that works the Fire TV is for you. There’s a reason why it is highly recommended from users throughout the Kodi and Reddit community as a capable streaming box. There’s very few boxes in this list that stutter in regards to video playback, the T95M is no different. Like the rest video playback on this device is top notch and shouldn’t cause any problems for any user (unless you get a defunct box). With the slow emergence of 4K televisions it’s important to have a 4K option when selecting an Android TV box. The T95M handles everything from 480 to 4K efficiently meaning video playback in Kodi shouldn’t be a problem. 16GB Storage. While a lot of the earlier versions came with 8GB internal memory the newer T95M’s look to include double the space to their predecessor. This helps tremendously if you end up wanting to use the box for more then a Kodi streaming application. Marshmallow 6 and Kodi 16. Some of the more popular options on this list include everything pre-installed yet they unfortunately are a few versions behind on there operating system and/or Kodi version. The T95M is perhaps the easiest and most up to date plug and play option on this list. Easy To Operate. I really loved the ease of use of this box. Being fairly tech savvy I was capable of using them all but the T95M was plug and play and seemed to “just work” after plugging it in. The remote. Surprise surprise! Another negative complaint about the remote of these boxes. Out of all of them tested I disliked the T95M’s the most and it felt the cheapest to hold in my hand. No Bluetooth! I typically use a wireless/USB keyboard mouse combo like the Rii8 so not having Bluetooth is a big deal however at this stage in development one should expect the device to have Bluetooth. *Please note, I couldn’t find BT in any of the settings so if you do see it in yours please let me know! 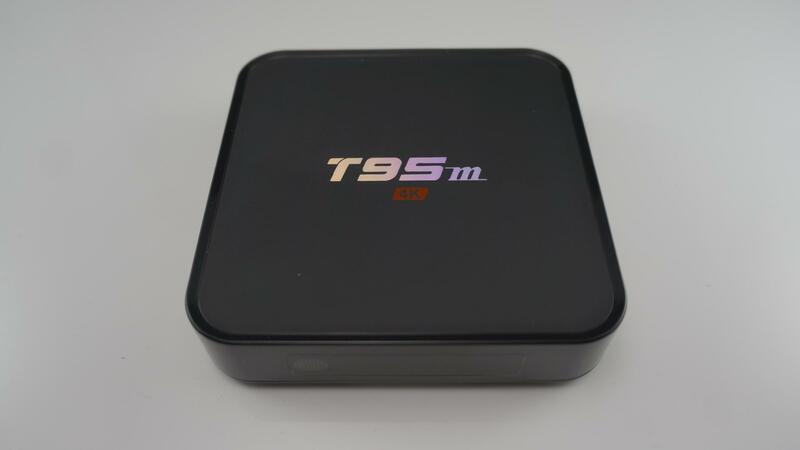 The T95M is relatively new to the scene but it’s already shown it can handle the needs of all Kodi users. With the added storage space and 2GB of DDR3 Ram included it’s an easy choice to handle all your content needs when streaming content through Kodi. While it doesn’t necessarily have the following of boxes like the M8S or Fire TV, it’s in the perfect price range, has more storage and ram and works just as well, if not better, then the others on this list. In the end the choice is up to you but at $56 dollars you won’t be disappointed in your investment. There are literally hundreds of options out there for Kodi (or so it seems). These are just the boxes that we’ve managed to have our hands on and test ourselves. While we’d love to test everything we haven’t so we hope that if there is a box you love then please feel free to drop a comment below letting us know and we’ll add it to this list. We hope to make this the most extensive list for affordable Kodi boxes under the $100 dollar mark.